You need two things for an unforgettable sport-adventure. The first is a road with twists and turns that lead from one spectacular view to another. The second is a bike with the performance to make the most of every mile - and there's no better machine to do that than the V-Strom 1000. It has a Suzuki fuel-injected, 90-degree V-twin engine tuned for incredible low-end and mid-range torque, so you can tap into thrilling acceleration in every gear. It has a lightweight rigid chassis and advanced suspension to provide remarkably crisp handling even on the tightest back roads. When you reach the open highway, the V-Strom 1000 excels. 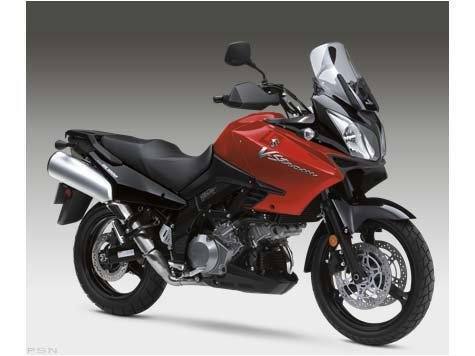 Its smooth engine performance, aerodynamic windshield and ergonomic riding position provide a level of comfort that makes it one of the finest sport-touring machines available. With the Suzuki V-Strom 1000, the sport-adventure is yours for the taking. Cartridge-style 43 mm front forks with adjustable preload provides 6.3 inches of wheel travel for a comfortable ride. Multi-reflector 60 / 55W headlights. Dual front disc brakes with large 310 mm rotors and twin-piston calipers, plus a single-disc rear brake with 260 mm rotor and single-piston caliper provide strong stopping power. Lightweight cast aluminum wheels with Dual Sport-style tires for optimum traction. 996 cc liquid-cooled, Suzuki fuel-injected, 90-degree V-twin engine with four valves per cylinder, dual-overhead cams and oil provides exceptional low-end and mid-range torque for exhilarating performance. Lightweight shim-under-bucket valve system operates 36 mm intake and 33 mm exhaust valves, with valve timing designed to enhance low-RPM power. High-mounted stainless steel exhaust system with aluminum mufflers are tuned to enhance engine torque. Upright, relaxed riding position, well-padded seat and aerodynamic fairing provide all-day-long comfort eight-adjustable windshield for increased wind protection and comfort can be adjusted to three positions in a 50 mm vertical range, work together with hand guards designed for maximum wind protection.